FASI NEW version Compact Dryer is versatile, high performance in a compact, portable design. FCD Series compact dryer mounted on a mobile frame, in addition to the dehumidifying air dryer and drying hopper, the unit also includes a three-phase loader. This new version compact offers more features as standard equipment with a smaller footprint than comparable systems, giving you maximum performance in minimal space. The FCD drying hopper is designed to create mass flow with no short pass. It is equipped with a programmable loader, which releases measured amounts of resin at specific intervals. Pellets are conveyed using warm, dry air and delivered for the next loading cycle on a just-in-time schedule. This keeps pellets at the optimum moisture level from the dryer to molding machine, maximizing performance and minimizing part defects. 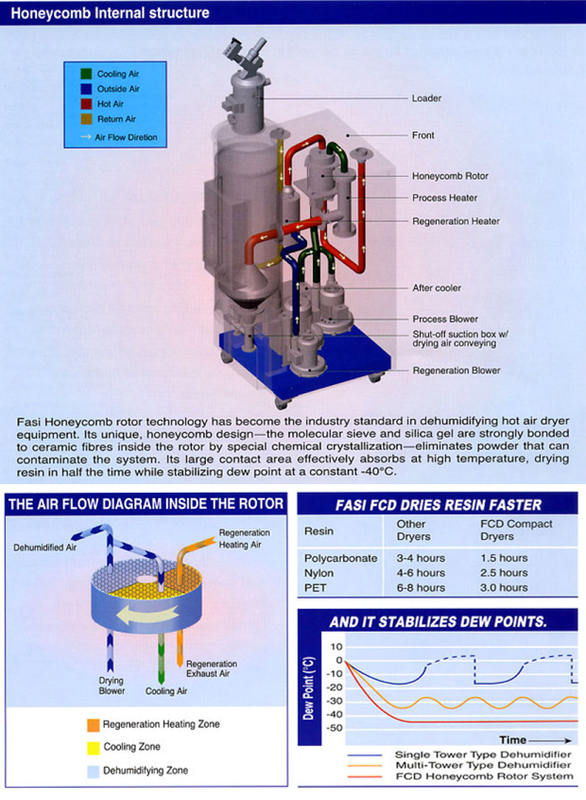 The FCD honeycomb rotor has a service life of at least 6 years, designed to run without replacement. Routine maintenance can be performed from the front of the system, quickly and easily.